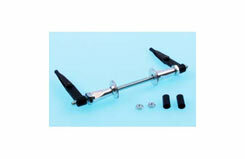 All Products > "5513880 Du-Bro DB880 Dual Contrl Horn 40-91"
For medium to large scale aircraft .40-.91. Comes complete with high quality aluminum horns, washers, steel 6-32 long shaft, nuts, horn arms, and kwik-links (for 2-56 rods). 2/pkg.